Today I am showing off some of my "first". This is my first foray into front/back side tatting. As long as I remember what I was doing it was fun. A couple of time I had to unknot knots because I didn't start with the 2ds. All in all it was a fun experience and I will probably do some more of this type of tatting. I am going to count this motif as part of my 25 Motif Challenge. 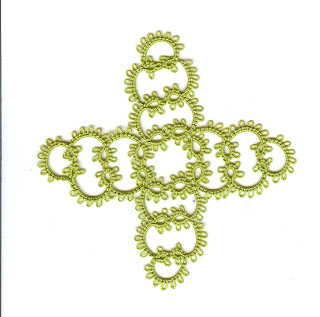 It is from the Emanuel Bocher 1912 Tatting Book we are studying and restoring in the Online Tatting class. Then it was my first attempt at needle tatting. It only took me about two hours to do this one little ring and there isn't much tension in it. 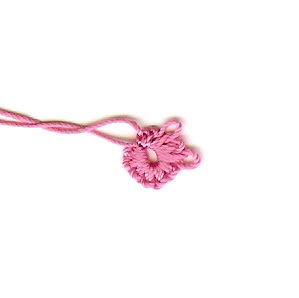 I don't think I like needle tatting but am will to work at it until I become more proficient. This looks very good! Congratulations! I always tat front side/back side any more. I personally like the look of it better. If you keep at it will get to be where you glance at your work and just know which side is which. Congrats on your front/backside efforts. It took me awhile to get the "hang" of it.